I’m back with another review. We can even call this an Easter edition of DavidNews.com. 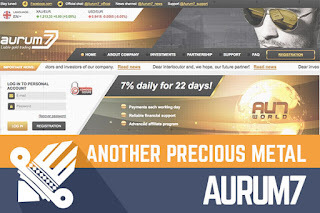 Today I’m reviewing a program called Aurum7, which has joined Sticky listing on DavidNews 2 days ago. It has been open and accepting deposits for more than 35 days. As usually, the first impression opening the website of Aurum7 is all about the gold. However, let’s not get too excited about the shiny layout and take a better look at this project. Players that have been in the HYIP industry for a while will notice that once in a while there are programs, which look very similar to the program, which has stopped paying and disappeared. Lately, I have noticed many websites having number 7 at the end of the domain name. Tree7, Zinc7 and now Aurum7. In fact, there are rumors in various forums that Aurum7 might be related to same admins, which were behind Zinc7. Moreover, the last is no longer available online and have stopped its “business”, but it was paying well for some while – almost 6 months, which is a long term. Another interesting fact is that this program ended last month and now we see another HYIP with a name of precious metal. There might not be the connection between number 7 in program names, but there is a possibility of a link between these two precious metals. The question is if this new program will be online as long as the previous one? As usually, my consumptions are based on information available online and on forums and shouldn’t be taken for granted and you can do your own research, in order to find out if there is a link. Their story is kind of predictable and I thought it’s going to be about gold and gold mining. In fact, it is their story. Well, you can’t blame the admin of Aurum7 for it, because it’s easier to come up with overall idea keeping in mind one main topic – in this case, gold (aurum in latin). Program admin claims that their main goal is to attract capital (your deposits) and distribute it into gold mining, processing, and trading. Aurum7 has two type of investment plans. First, 7% daily for 22 working days and second is 110% weekly after 7 days. In both plans, the initial deposit is included in the payments. For example, $200 invested in the first plan will make $14 a day, but keep in mind it’s not a revenue because the initial deposit is included here. After 14th-day deposit starts making money. Of course, at the end of the plan – after 22 days investor would have $308. Subtract the deposit and you see the potential revenue. As usually, I’m explaining these plans, in order to avoid misunderstanding of profits. Often admins create complicated plans, in order to make it look great, but in fact they are not. Keep in mind this is just a calculation and nobody can guarantee you that this HYIP will not stop paying one day. To wrap it up, the project looks like any other HYIP out there. There could be a potential link between Aurum7 and Zinc7, which stopped paying a few weeks ago, but no one is for sure. Of course, it’s just my assumption based on the communication on forums among some skilled players in the industry. I didn’t notice anything else unusual in their story, communication approach or their website. The main question here is how long this project will be paying? It can pay for few days or even several months, no one know for sure this time. Please keep in mind that I’m gathering the information, in order to help you saving the time of googling and reading. All HYIP’s are highly risky and you are the only person responsible for your investments. Therefore, if you ever decide to make any investments, don’t invest more than you can afford to lose! Investment plans: 7% daily for 22 working days, initial deposit included in the payments. 110% after 7 days, initial deposit included in the payment.